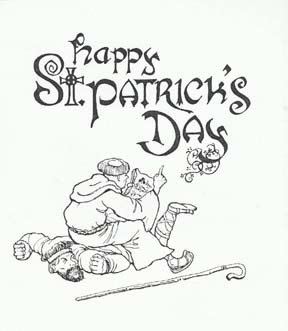 If you are interested in humorous reflections on the history of St Patrick's Day in Ireland you might like to pay a visit to one of the seasonal shows that the Armagh Rhymers present at various venues and locations. 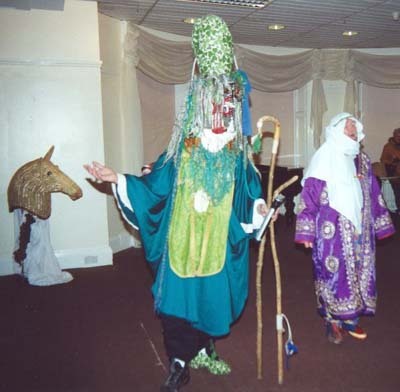 Using traditional mummers repertoires, with skilfully constructed traditional costumes, masks and decorations, their performances are a delight for audiences of absolutely any age, from pre-school age onward. If you are interested in their performances you will find the relevant information on their website; if so click here. Tracing the history of any event is always a difficult and necessarily selective endeavour. Without quoting any source for their information, the Belfast Telegraph (11 March 2005) claims that 'the first St. Patrick's Day parade took place not in Ireland, but in the United States, when Irish soldiers serving in the English military marched through New York City on March 17, 1762'. In such ways vague information and misinformation become intertwined and may in the process of dissemination develop their own momentum. Professor Brian Walker from QUB's Institute of Irish Studies provides a more detailed picture (with source information): 'Celebration of St Patrick's Day in the American colonies was first recorded in 1737 in Boston and in New York in 1762' (Walker 1996:85). He also informs us that in 1713 Jonathan Swift had commented in writing on public St Patrick's Day celebrations in London. Professor Walker is concerned with the changing images that have been ascribed to St Patrick's Day (and other public commemoration celebrations) over time and at different locations. Detailed information about these topics can be found, for instance, in his books Dancing to History's Tune (IIS, 1996) and Past and Present (IIS, 2000). For the not-so-seriously-minded, there are other topics of interest that can be investigated, for instance: when did people start to dye their hair on St Patrick's Day, or their beer? 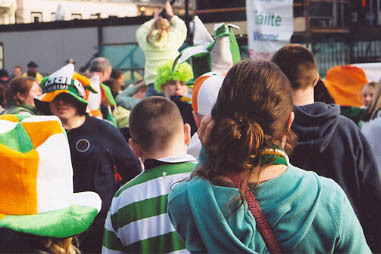 At least in present-day Belfast, there seem to be a considerable number of people (especially the very young ones) who enjoy the carnevalesque atmosphere of the event, and although I prefer my own hair in its natural colour, I can certainly appreciate the signs of creativity in green-derived head decorations displayed at present-day Belfast St Patrick's Day celebrations. The question, however, of their historical emergence can not so easily be answered, as no detailed study of this topic seems to exist. What about the custom of the green beer then? Is it really a recent American invention? Or is this view just another result of these half-truth myth-making processes? As far as the question 'trad or no trad' is concerned, you may find it interesting to know that green beer is a traditional drink in Berlin, where it is served all year round, but especially in the springtime. It is flavoured with a natural herb called Waldmeister (woodruff/galium odoratum), which has a pleasant smell and taste, and is used to flavour traditional drinks in spring celebrations of various cultures. The plant is also used in herb medicine, as it has a beneficial effect on blood circulation problems. So the 'recent invention' of green beer on St Patrick's Day may in fact be a reclaiming of customs or traditions associated with ancient spring rites. After all it has been observed that green things often have health-improving qualities, and in any case one green beer on St Patrick's Day will do a lot more good than the consumption of a dozen or more of the ordinary colour. It is also more recommendable than chewing on shamrocks - unless, of course, you are a 4-legged creature habitually doing so. The history of shamrocks is again a little difficult to research, as various different species of plant are associated with this term. In The Year in Ireland (1972) Kevin Danaher describes an experiment by the 19th-century botanist Nathaniel Colgan, who had asked people from different parts of Ireland to send him living rooted specimens of 'the real shamrock'. When he planted and grew these he found a fairly large number of plants of ordinary White Clover (trifolium repens) and Lesser Trefoil (trifolium minus) which has yellow blossoms. But he also found a few specimens of Purple Clover (trifolium pratense) and of Black Medick (medicago lupulina) in his collection. Interestingly several people who saw his fully grown blossoming plants refused to admit that any of them could possibly be 'the real shamrock'. 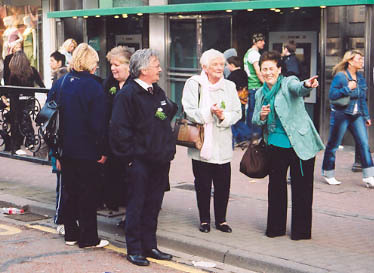 So opinions appear to be divided about the 'true identity' of shamrocks, but in any case it seems that in present-day Belfast they all are more likely to appear in gardens and on window sills than on lapels as a St Patrick's Day decoration. In fact the most likely location for them to appear nowadays is in songs and music, and after all that is what we had been looking for on St Patrick's Day in Belfast.